Exclusive video of Natalie and I! It’s been a few intensive weeks since I started training at the Bolshoi Ballet Academy in Moscow and without the support from the Genesis Foundation I would have never be able to undertake my three-year training there. The significance of getting into the Bolshoi is an absolute dream come true and I can’t describe how truly thankful I am to John Studzinski for it. Please visit the Genesis Foundation’s website or Youtube channel to watch an exclusive video of Natalie and I discussing the Bolshoi, the Genesis Foundation and how exciting all of this is! 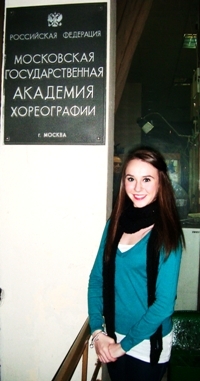 I am very excited to tell you all that I have finally completed my first full week at the Bolshoi Ballet Academy. It is such a relief to actually be able to dance again. Slowly but surely my ballet teacher Miss Vera Potashkina has now started to take more notice of me in class (which is a good sign) and she is providing me with corrections at the Barre in order to improve my dancing. My body is still weak in comparison to how it was back home in Scotland but nothing a few strengthening exercises before bed can’t fix and in no time my body will be back to normal. On my day off (Sunday), Natalie Carter, Daniel Dolan and myself walked for 2 hours into the centre of Moscow which is 5 metro stops away (approx 6 km) to find the dance shop Sansha. I had a lovely day and it was really interesting learning about the history of all the buildings and being able to see the beauty of Moscow. I feel I am really starting to settle into Bolshoi life and I am beginning to establish a routine within my timetable. I have already made some great friends here; especially my room mate Natalie who has been an absolute gem since I arrived here. I do feel sorry for her though having to put up with my silly antics in the academy poor Natalie! Despite having only danced for a week I have completely destroyed two pairs of Pointe shoes due to the heavy work load in class. Every Monday we have a Pointe Barre work, then every second day we alternate between Pointe Centre and Allegro, also on Saturday I have Pas de Deux which is of course on Pointe. So my toes are certainly not looking too nice right now! Russian ballet technique is very different compared to what I studied in Scotland as it is very focused on sustaining height of leg, having 180 degree turnout and my teacher favours a quick precise Barre so she can spend more time on the harder more advanced steps in centre. This has certainly been harder for my body to adapt to and although I am far from happy with how I am dancing at the moment I need to remember that I have been ill and absent from dance for 2 weeks and it will take a while for everything to settle back into its rightful place. Also the fact that there are raked floors in all studios; this is something we do not have in Scotland. I find this challenging, but to be honest I am glad because I wasn’t expecting anything less, and I came here for the ultimate challenge! Unfortunately I am unable to dance for 2 days as I sprained the ligaments in my toe … but 2 days is nothing and I am just so glad it is only a couple of days and this time there will be no stopping me, as I am hoping that all the bad luck is now over and illness and injuries will no longer be the main topic of my blog. I am looking forward to telling you all about my future dance adventures and hopefully you will enjoy reading about them as much as I enjoy dancing them!